Anchovy Classic Bait Head - Clear, Rigged Double Snelled Barbless Hooks - Trinidad Tackle Inc.
With the development of the Ultra-Violet (UV) BLUE VIOLET JELLY FISH effect in our bait head rigs, Trinidad tackle has changed how anglers use whole bait while trolling the waters of the Pacific and fresh water lakes. Research has shown that the eyes of the Pacific Salmon contain a number of nerve cells that are sensitive to Blue and Green. Research has also shown that ultra-violet light is able to penetrate to depths of 700 feet. Our bait head rigs work best at daybreak and during low light conditions. The Anchovy Classic baitfish head is designed for use with Anchovies and other whole baitfish. It is designed to produce a tight, revolving “wounded” fish action that stimulates aggressive feeding fish. A normal roll will revolve at 1 to 2 times per second. Baitfish from 4 to 7 inches (10 to 18 cm) can be used. Frozen bait must be carefully thawed before using. Handle carefully to avoid damages tails etc. Slide hook down 5 to 6 inches (13 cm) away from the head. Place the head of the baitfish snugly into the cavity of the plastic head making sure the back of the bait is on the same side as the leader exit hole. See Fig #1. With bait held tightly into the head cavity, insert plastic pin into large back hole. Pin can be inserted from either side. Round or flat toothpicks can be used in the smaller hole if required. See Fig #1. While holding the baitfish, insert hook into side of bait below the rear of the dorsal fin, just above the line separating the silver colored belly from the darker back. Set hook in a dark area with hook shank lying flush against bait. See Fig #2. Hold plastic head in one hand and carefully pull a curve into the bait (towards the hook side.) Curve should be “even” below the hook. Bait does not revolve or for slower trolling – pull additional curve into bait. 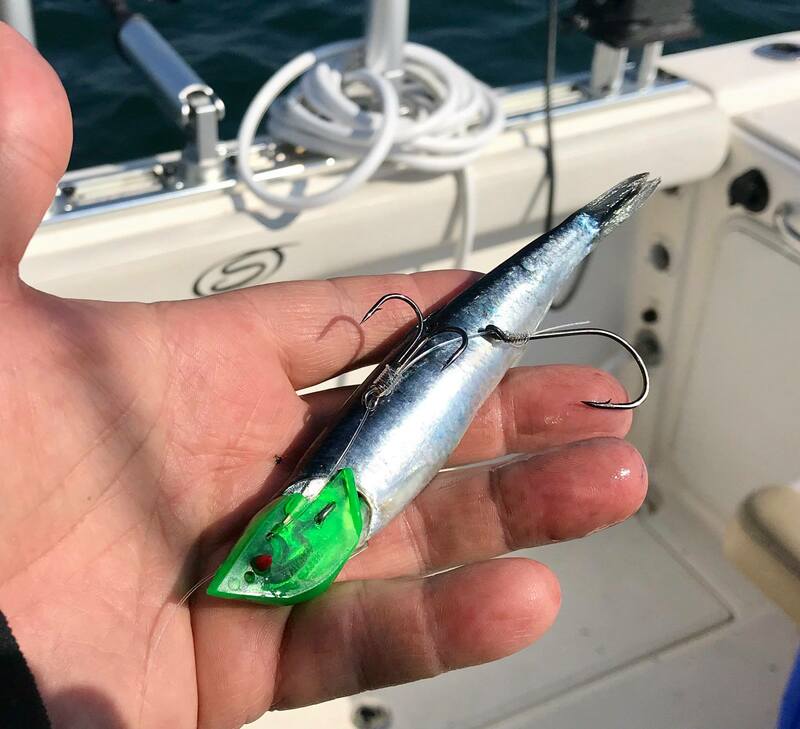 Bait is revolving too quickly or for fast trolling – hold plastic head with one hand while pulling back on the hook with the other hand. This will put less curve in the bait. To obtain the exact roll – slight adjustments may be required.